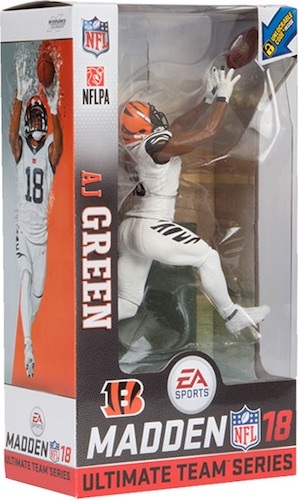 Merging the collectible and virtual worlds, the 2017 McFarlane Madden NFL 18 Ultimate Team Figures line combines the visual appeal of a detailed likeness with codes that can be used in the Madden NFL 18 game. 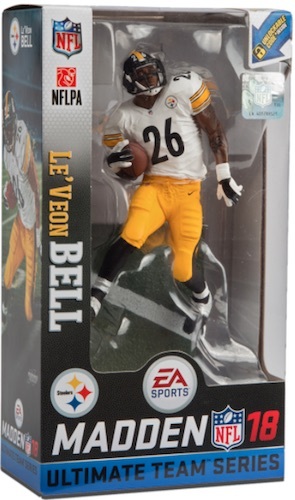 Similar to 2016, the set features a mix of seasoned stars and top young players. 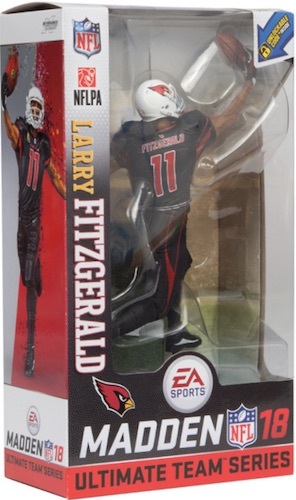 Issued throughout the football season, Series 1 starts with established options like Larry Fitzgerald, A.J. 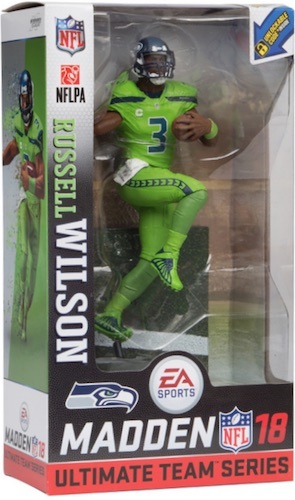 Green and Russell Wilson. 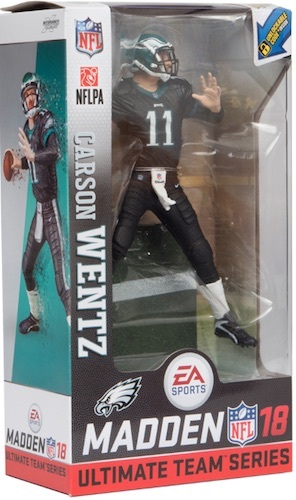 2016 rookie quarterback Carson Wentz also enters the fold. 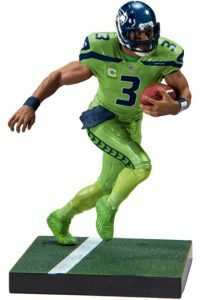 Sporting vibrant uniforms, the figures display the "Color Rush" jerseys seen on Thursday Night Football games. 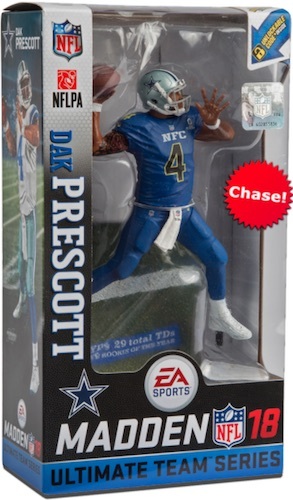 Chase variants average one per eight-figure case and offer a more limited version to track down for Fitzgerald, Green and Wentz. 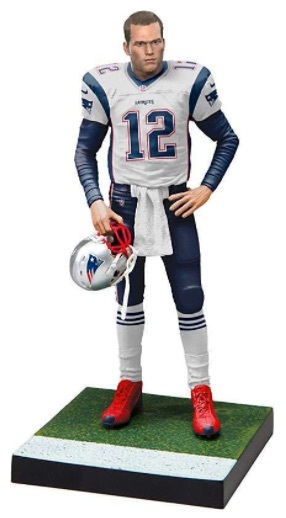 Even Tom Brady enters the mix with an exclusive figure in Series 1 and Series 2. 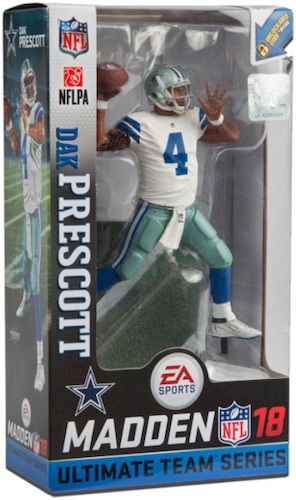 Adding to that, Series 2 brings collectors debut figures for standout quarterbacks Dak Prescott and Derek Carr, as well as star running back David Johnson. 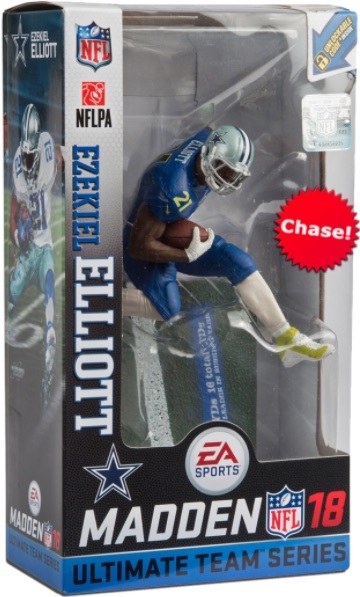 There are also Pro Bowl chase variants for Prescott and Ezekiel Elliott, while Elliott has an exclusive blue jersey version through Clark Toys. 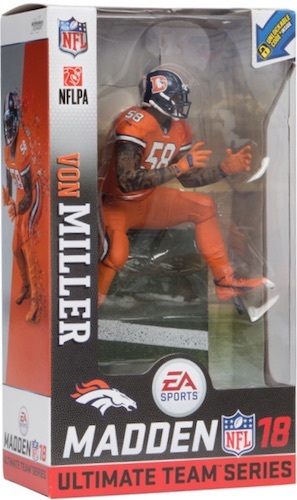 Tying in with the very popular Madden video game franchise, the seven-inch figures come with a redeemable code good for Madden NFL 17 Ultimate Team Pro Packs. 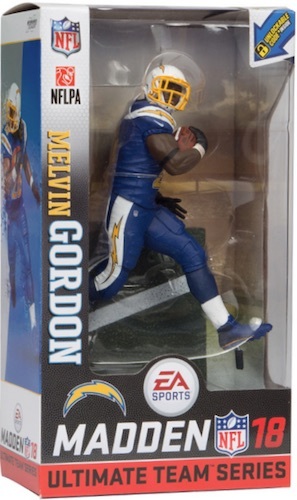 If the pattern holds, as many as three different series releases will be in play for the 2017 McFarlane Madden NFL 18 Ultimate Team Figures. 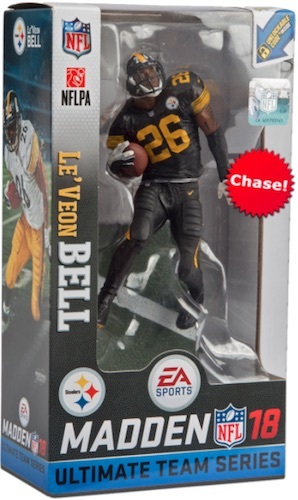 This guide will be updated as more information is revealed. This is tentative checklist and subject to change. 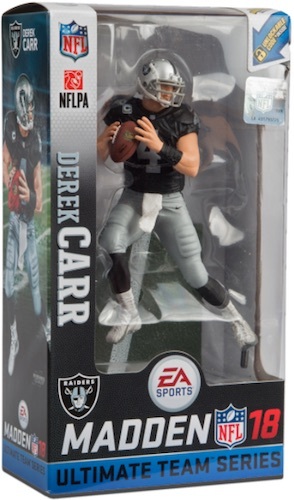 Madden 18 Ultimate Team Series McFarlane Toys Derek Carr Series 2 NEW! 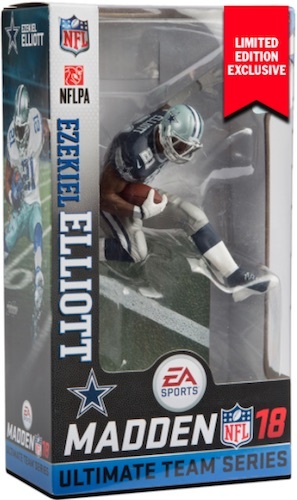 Dak Prescott Dallas Cowboys EA Sports Madden 18 series 2 McFarlane NFL MINT 7"
The Tom Brady figures are marked “Exclusive” but do not indicate which retailer owns the exclusive sales rights? 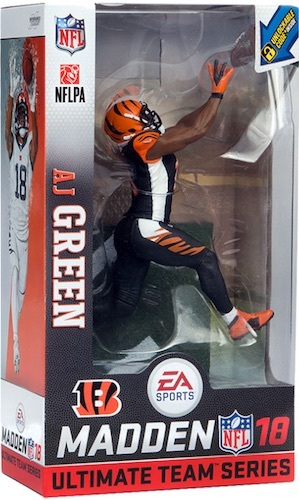 Any information on this relationship is appreciated. Ed: The only confirmation we have at this time is that it is an exclusive. 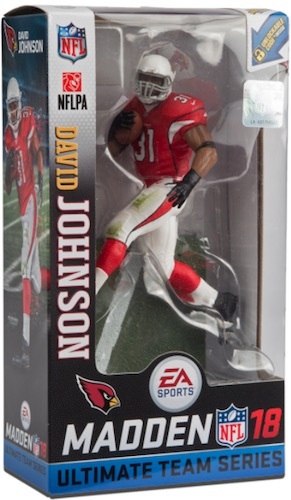 Some sellers on eBay have it listed as being from Target, but we don’t add that info until it can if be verified. 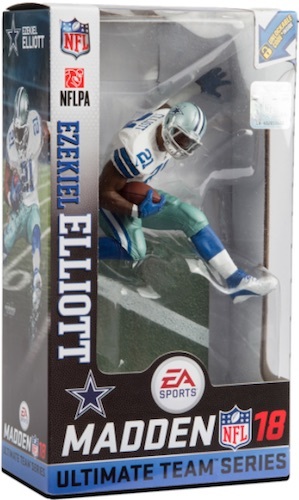 What stores typically sell the McFarlanes? 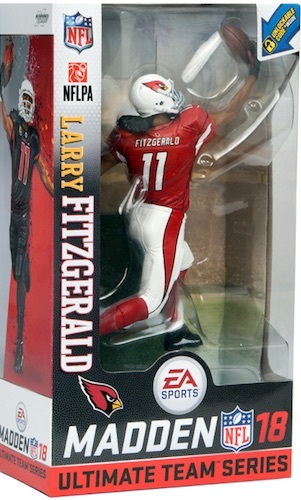 I used to be a enjoy collecting sports figurines but moved away from it years ago. 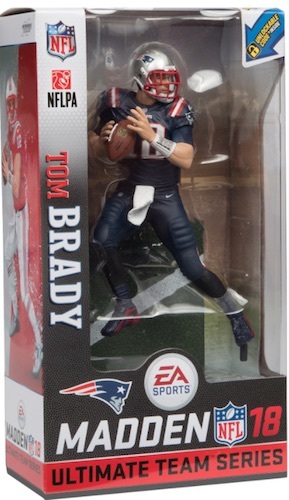 It seems like when McFarlane lost its license for Hockey and Baseball they really scaled back on its Football and Basketball product also. 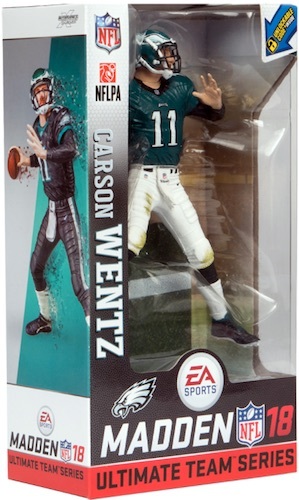 Unless it has a tie in like these Madden ones you pretty much never see a new release from McFarlane anymore. 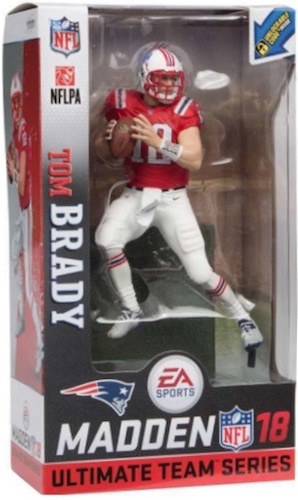 That being said I never liked the Imports Dragon figures which do not have the same quality as the McFarlane line does.